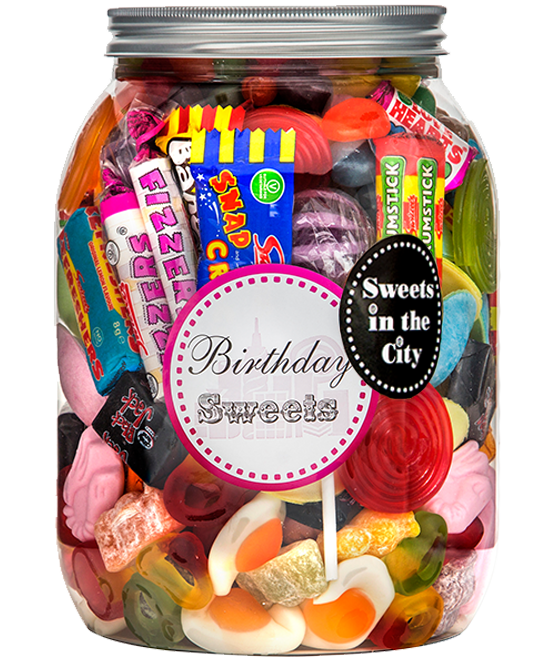 Sweets are the best part of any birthday, and this yummy selection of birthday sweets is sure to make their day! 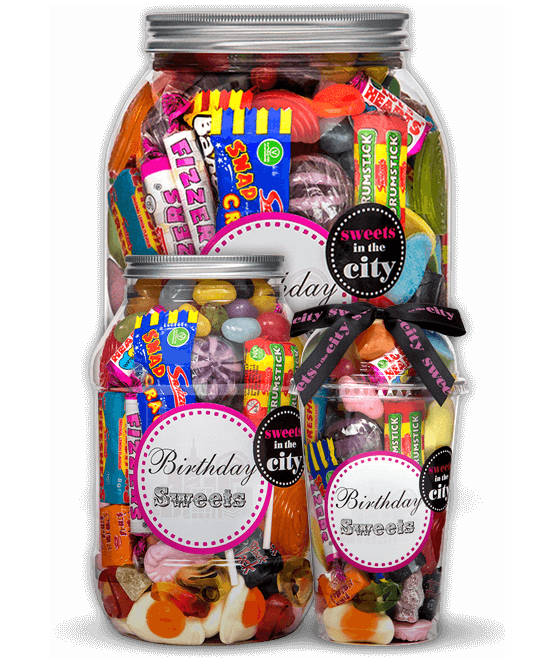 If you're looking for a sweet gift to give a special someone on their birthday, then look no further! 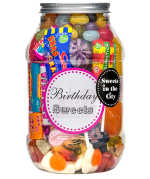 Our ‘Birthday Sweets’ jar is filled with an assortment of delicious treats – making it the perfect present for any friend or loved one’s birthday that happens to have a sweet tooth! 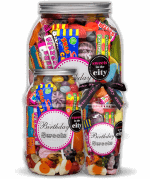 Certain to put a smile on the recipient’s face and to delight any sweet lover on their birthday no matter their age, our Birthday Sweets Jar is just the gift you need. 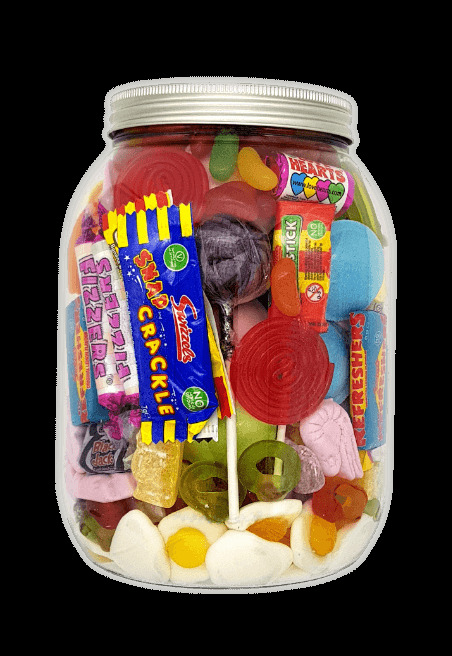 Product 1: Glucose syrup, sugar, gelatine, dextrose, acid, citric acid, flavouring, fruit and plant concentrates: lemon, safflower, apple, aronia, blackcurrant, kiwi, grape, elderberry, mango, orange, passion fruit, spirulina, glazing agents, beeswax, carnauba wax, caramelised sugar syrup, elderberry extract. Product 2: Glucose syrup, sugar, water, palm oil, colour (vegetable carbon), beef gelatine, acid (citric acid), emulsifier (SOYA lecithin), aniseed oil, spirulina concentrate. Product 3: Glucose syrup, sugar, palm oil, acid (citric acid), fruit juice concentrates (apple, pineapple), beef gelatine, flavourings, emulsifier (SOYA lecithin), colours (anthocyanin, paprika extract). 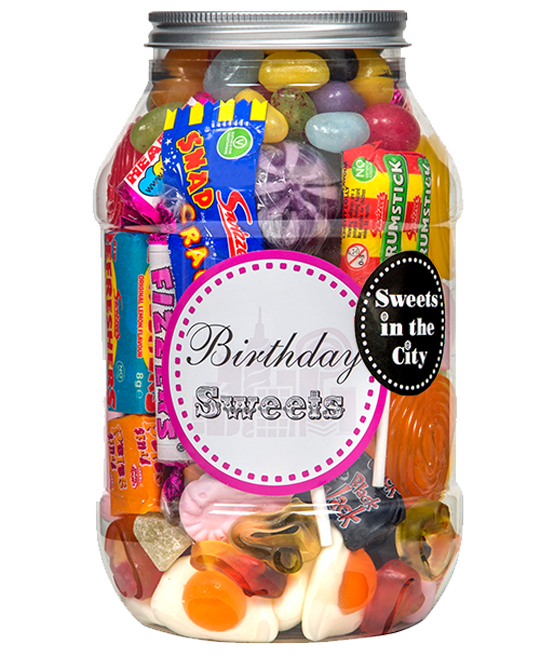 Product 4: Sugar, glucose syrup, acidity regulators: citric acid, malic acid; flavouring, colours: E120, E133. May also contains MILK, NUTS, SOYA and GLUTEN. 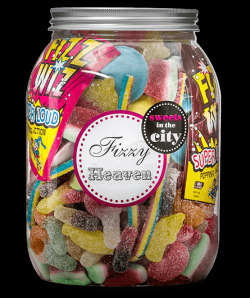 Product 5: Sugar, maize starch, dextrose, acid: E334, acidity regulator, E500, Flavourings, colours: E100, E132, E162. 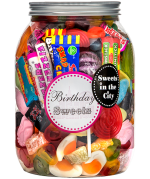 Product 6: Sugar, glucose syrup, Water, Pork Gelatine, Stabiliser: Sorbitol; Colour: E120; Vegetable Oils (palm, kernel, coconut), Flavouring, Glazing Agent: beeswax, carnauba wax. Product 7: Sugar, glucose syrup, gelatine, acid (citric acid), flavourings, fruit and plant concentrates: apple, arronia, blackcurrant, carrot, elderberry, grape, hibiscus, kiwi, lemon, mango, orange, passion fruit, safflower, spirulina, glazing agents: beeswax, carnauba wax; caramelised sugar syrup;elderberry extract. Product 8: Glucose Syrup; starch; Sugar; Humectant: Sorbitol Syrup, Acid: Citric Acid; Emulsifier: Mono-and Diglycerides of Fatty Acids; Flavouring; Colours: Curcumin, Copper Complexes of Chlorophyllins; Elderberry Extract; Glazing Agents: Beeswax, Carnauba Wax; Fruit and Plant Concentrates (Elderberry, Blackcurrant, Aronia, Grape). Product 9: Sugar, Acidity Regulator: Malic Acid; Stearic Acid, Sodium Bicarbonate, Modified Starch, Magnesium Stearate, Anti-Caking Agent: Magnesium Carbonate; Flavourings, Colours: Anthocyanin, Copper Chlorophyllin, Curcumin, Lutein, Paprika extract. Product 10: Sugar, glucose syrup, water, modified maize starch, acid (malic acid, fumaric acid, citric acid), flavourings, glazing agents (beeswax, carnauba wax, shellac), vegetable oil (coconut), colouring food, concentrates (apple, spirulina, safflower, carrot, blackcurrant) (extract of nettle, spinach, turmeric), colours: E100, E120, E131, E132, E133, E150a, E150d, E153, E171. Product 11: Glucose syrup, sugar, dextrose, gelatine, citric acid, flavourings, fruit and plant concentrates (elderberry, orange, lemon, mango, passion fruit), safflower,glazing agents (beeswax and carnauba wax). May also contain: MILK, NUTS, SOYA and GLUTEN. Ingredients on Wrapper (Love Hearts, Mini Me, Drumsticks, Refreshers). 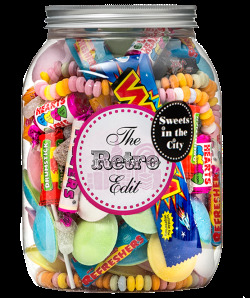 The Sweet in the City jar is unique, professional and I really really like it! It is a little bit on the pricy scale but overall I feel it's worth it. 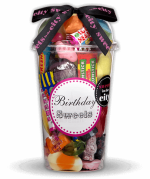 Purchased Birthday Sweets as special offer with customised label for Christmas. 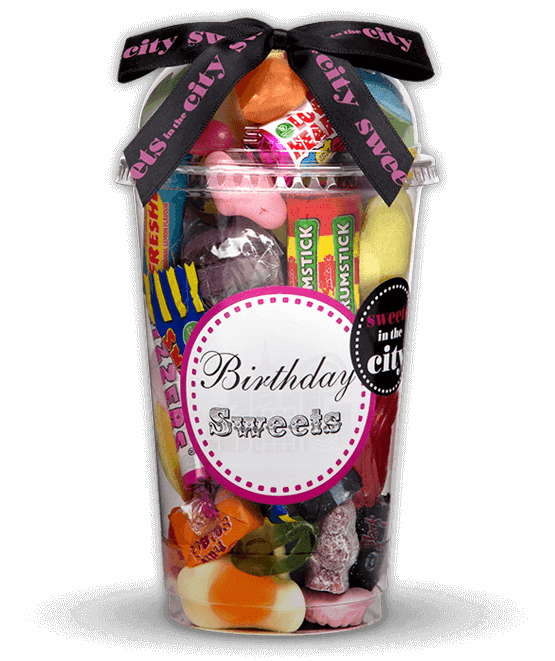 Would help if the sweets weren't labelled Birthday Sweets at the back so they can be used for various occasions. My brother loved his birthday sweets and at 8am on his birthday, he text to say thank you and that he had already eaten half the sweets and they were lovely! Very pleased with the sweets. Very good quality and great delivery service. Excellent birthday gift. Would highly recommend to others. Great price too.....jam packed with goodies ☺☺ 5 stars service.